I sometimes worry that I'm right smack in the middle of my life. Right there in the middle. I watched Adaptation tonight (technically, last night, as I write this). 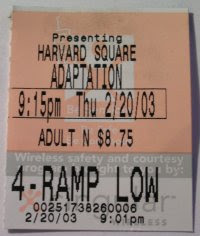 I hoofed to Harvard Square, and drank in a little atmosphere before disappearing into the "4-Ramp Low" screen at Harvard Loews Cinema. The twist in the movie reminds me a great deal of Paul Auster's The New York Trilogy. The first book, City of Glass, features a character who receives a phone call. "Is this Paul Auster?" asks an urgent voice. The main character says "No." But after repeated phone calls for the mysterious Paul Auster, the main character eventually says "Yes." Charlie Kaufman writes himself into his adaptation of Susan Orlean's book, The Orchid Thief, and we're on a marvelous and perilous journey as Charlie struggles with how to structure a screen play on top of a structure-less novel. Adaptation is about creativity. It's also about passion. 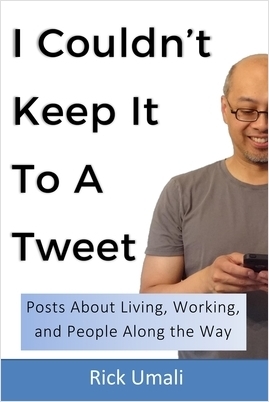 It's about the writing life, depicted in all its difficulty, and banality. In Kaufman's other screenplay, Being John Malkovich, we peek inside the head of the actor Malkovich. In Adaptation, we take a peek inside the screenwriter, and oh, how twisted it is. This is the second movie I've seen in the theater this year. Somehow, I made it to work, despite the heavy heavy snow fall. I shoveled a little bit last night, after dinner, during the heavy snow fall, and I shoveled a lot in the morning, to dig my car out. The temperature promises to break 35 degrees tomorrow, and through the weekend. I'm hoping for a little snow-melt. I'm hoping for a little relief. Bob Herbert of the New York Times wrote a telling op-ed piece about joblessness in America. It's heartbreaking, actually. "If you want to see desperation close up, look at the eyes of the increasing numbers of breadwinners who can't find work." Michael Pouliot died in Kuwait last month. He was a founding member of Tapestry Solutions. Mike leaves two daughters and a wife. I found out about his horrible death this afternoon from NPR. Michael wasn't a soldier. He wasn't a reporter. He was a software engineer. A programmer. He was like me, and all the rest of us computer folks, except he worked on defense software. He was a military contractor, and he was in Kuwait installing software. He was driving in an SUV with David Caraway, another Tapestry Solutions programmer, when an unknown number of unidentified gunmen opened fire on it. David was injured. Michael was killed. Reading the eulogy on the company web site, I see that Mike had a focus on military software. He had a real customer-focus, and believed that you needed to be near the users to understand their issues. For him, this meant being in battle-scarred Kuwait. I don't think young students studying computers ever think about being in harm's way. I know I never did. But from my job at a computer systems company that serves the defense industry, among other markets, I can sense first-hand the reliance of computers in war-fare. I often see hardware chassis that will make their way into planes, and battle cruisers. I'm at peace with this. Bigger companies build the planes, or the cruisers, or the tanks, and then they put our systems in them. We're just a small piece of the machinery. Well out of harm's way. But as systems get more complex, as the reliance of computer systems grows, more and more military contractors are finding themselves near the front-lines. And with last month's news about Mike Pouliot, the proximity to this danger can be perilous. Unlike our intrepid astronauts, for whom the risks were well known and understood, Mike's job as a software engineer (and company executive) should have been risk-free. I'm sure he was told to "be careful", but he was a civilian. He was just there to install software. I'll feel the senselessness of his death. The randomness. As we head towards a confrontation with Iraq, I will be remembering Mike as already having paid the highest-price for our freedom, and for our military. Like all of us, I'm still dealing with the recent tragedy of the Space Shuttle Columbia. I take solace in President Bush's speech from that dreadful Saturday morning, February 1: "The same Creator who names the stars also knows the names of the seven souls we mourn today. The crew of the shuttle Columbia did not return safely to Earth; yet we can pray that all are safely home."